Randhir Singh Dheera and Prem Sagar alleged ‘touts’ of suspended Chairman of the PPSC Ravinderpal Singh Sidhu today submitted an application in a court here seeking permission to turn approver in a criminal case registered against them on April 30 at Patiala. It seems to be the “guilt conscious” of the former SGPC Secretary, Mr Kulwant Singh, which forced him to pen down his memoirs. Mr Kulwant Singh who was a close confidant of Mr Gurcharan Singh Tohra, the then SGPC chief, had switched over his loyalty to Mr Parkash Singh Badal, the then Chief Minister, when they (Tohra and Badal) were engaged in a tug-of-war. Mr B.C. Rajput, District and Sessions Judge here today transferred the trial of the dowry death case registered against former Jathedar of Takht Damdama Sahib Giani Kewal Singh, his son Baljinder Singh and one other kin Joginder Kaur to Additional Sessions Judge, Mr Jaspal Singh. 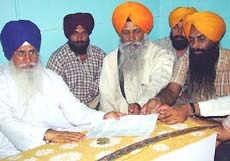 Even as a deputation of the Sikh Students Federation (Mehta) submitted a memorandum to Giani Joginder Singh Vedanti for summoning Mr Gurcharan Singh Tohra, President, Sarb Hind Shiromani Akali Dal, at Akal Takht, the Jathedar said the matter would be discussed at the meeting of Sikh clergy scheduled for July 24. English is proposed to be introduced from Class III in and maths and science subjects are to be taught through the English medium from Class VI onwards, in Punjab schools. Nearly nine months after former Chief Minister Parkash Singh Badal laid the foundation stone of the multi - crore overbridge proposed to be built at railway crossing number 22 in the city, the project seems to have come within reach again with the district administration taking up the need for immediate start of work on the project with the government. The Personnel Department headed by the Punjab Chief Secretary, Mr Y. S. Ratra, today formally sent the invitation and the agenda to members of the Joint Consultative Machinery ( JCM), which meets on July 26. The agenda items have been prepared on the basis of the representations submitted by the various employees unions to the Government in the past one month. The lawyers, for Human Rights International (LHRI) has urged the CBI to conduct an inquiry into the 10-year-old incident of throwing of acid on Chhotu Ram, a resident of Goniana Mandi, and rendering him blind. The person allegedly responsible for the incident is at present a judicial official of the Punjab cadre. Prof Manjit Singh, Jathedar of Takht Sri Kesgarh Sahib, today launched a “chetna lehar” (awareness campaign) against the controversial Baba Piara Singh Bhaniarawala and his anti-Sikh religious acts by organising a gathering of various Sikh organisations. 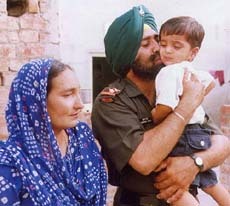 An emotional army man kisses his child while his wife looks on, before leaving to join duty at some boarder area, after spending vacations with his family in Bathinda on Thursday. Even though a case was registered in May against the son-in-law of former Vice-Chancellor who is also the head of the MCA Department in Guru Nanak Dev University, he is being shielded, alleged Mr Satya Pal Dang, veteran CPI leader. Only six per cent of land in the State was under forest cover. It should be at least 30 per cent to neutralise the menace of increasing pollution. If we failed to achieve this coming generations would suffer and curse us. With the unrelenting heatwave claiming another life in this district today, the death toll has risen to 16 in the past about two months. A 40-year-old person was found dead due to sunstroke on the outskirts of Goniana Mandi, 15 km from here, today by volunteers of the Sahara Jan Seva. Udaipal Singh shows marks on his brother Abhay Pal Singh. Abhay Pal Singh Sandhu (12) and his brother Udaipal Singh Sandhu (16), with tears in their eyes, today narrated the tale of physical and mental abuse allegedly inflicted on them by their father Jaspal Singh Sandhu who is Head of the Department of Physiotherapy and Sports Science at Guru Nanak Dev University. In perhaps the first case of its kind in this town, a baby, born three months premature, has won a fight for survival. After remaining in an incubator and close medical supervision in a local nursing home, the baby is now back home. The Punjab Chief Minister, Capt Amarinder Singh, today called on the farming community to come out of the paddy-wheat rotation and turn to oilseeds, pulses and vegetables as it was a need of the hour. The “cyber patwari” is here with “jamabandis”, “mussavis” and “intkals” over Internet. This is not fiction but a dream come true for landowners of Fattu Dhinga, who can now access their records from a computer centre at the district courts or through an internet kiosk. The Punjab State Electricity Board yesterday banned the use of air-conditioners till July 23 in all commercial establishments of the state besides cutting down on streetlighting. Trying hard to keep the Punjab State Electricity Board floating, the state government has arranged funds to the tune of Rs 110 crore to it from the Punjab Mandi Board and the Punjab Urban Planning and Development Authority. With the arrest of Rajkumar, a resident of Khandwala, the district police has today busted a gang allegedly involved in printing duplicate government lottery tickets worth lakhs of rupees. A group of miscreants ransacked and looted more than a dozen shops in the Safabadi Gate locality here late this evening after a quarrel which erupted during the course of a langar programme. Two lovers residents of the Maqsoodan area here today committed suicide allegedly fearing their separation due to parental intervention. Even as candidates who were not selected for admission to ETT institutes have formed the ETT Anti-Corruption Action Committee (ETT ACAC) to expose the corrupt practices, those who were selected today said that they would launch a campaign against the committee as their selection was fair.